I've commissioned the talented artist artastrophe, creator of the portraits in the PaintBG collection, to create 16 new NPC portraits to share with the community. We would like to invite all players and especially modders of the respective NPCs to provide input on colors, poses, clothing and accessories for each NPC, and then to provide feedback as artastrophe posts snapshots of her works in progress. This leaves 9 more NPCs to be chosen. The mod Dark Side of the Sword Coast is fairly popular and has 9 joinable NPCs, so that is a possibility. Other suggestions are welcome. As the portraits are intended for the community, we'd like your input on how best to portray them! So please comment and/or info-dump if you can offer some insights into these characters. P.S. Mike1072 suggested some revisions for the existing portraits in PaintBG and I've also expressed interest in additional variants for Imoen and Gavin. I've asked artastrophe to focus first on creating portraits for NPCs that don't have PaintBG portraits yet, but more suggestions for revising existing portraits are also welcome. edit: and thank you for finding Kido, woo!! Edited by artastrophe, 26 January 2016 - 08:18 AM. Thank you for doing this, great news indeed! Having never played NPC mods extensively, I can't really give feedback on them. I've pictured him along the lines of how artastrophe has imagined Soulafein - frontal gaze, focus on eyes, kindly yet badass expression. Distinctive features: Drizzt has deep lavender eyes as well as his green cloak. Reference art: portrayal of Drizzt by Todd Lockwood: http://toddlockwood....dourden/drizzt/ (there are more images in the album). 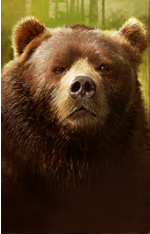 Wilson the bear - hidden NPC from BG2:EE, while not as deep in character as his more humanoid counterparts, it would be nice to have Wilson be re-imagined, at very least for "art for all NPCs" completion sake. Good idea about the Siege of Dragonspear NPCs. Is there more information about those NPCs somewhere? We might have to wait until release to learn enough about them to come up with fitting portraits. 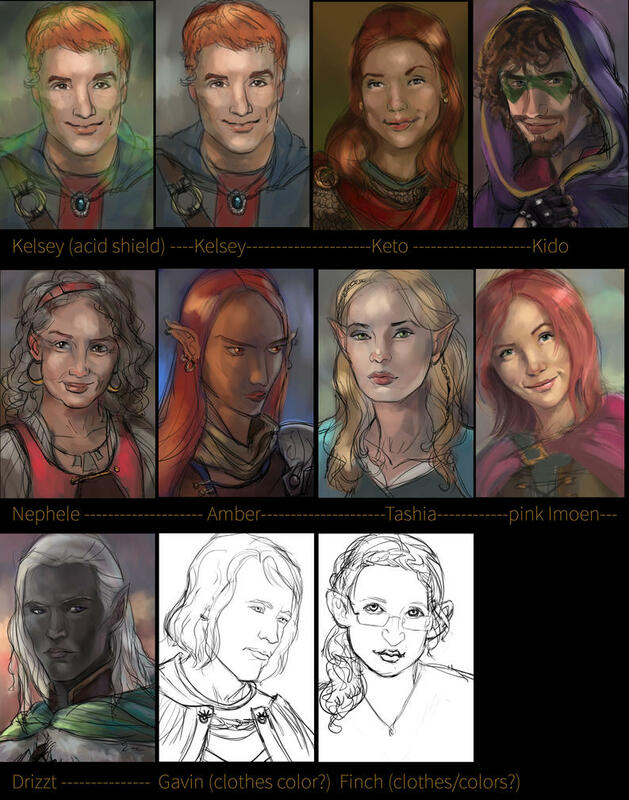 For insight into some other NPC personalities (notably Kelsey and Nephele so far from our current list), Pentalion on the Beamdog forums has been posting reviews. Edited by agb1, 26 January 2016 - 11:06 AM. I already have a couple of the new Siege of Dragonspear NPCs done (and the other two like 85% done) so I won't be counting them for this group of 16 but they will be available! Thanks for the Drizzt info + the link with the mod NPCs; I'm reading through that right now! Edited by artastrophe, 27 January 2016 - 09:06 AM. There's two versions of Kelsey, one with some glowy green tints for his special Fire Shield: Acid power -- if anyone has a preference which I should finish? Kelsey - I prefer the version without the acid shield. Maybe give him a softer jawbone or a slightly narrower face? Kido - I really like this portrait. I haven't played him though so I will defer to other opinions. 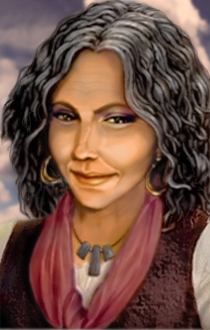 Imoen - I really like this portrait! But her right eye (our left) looks a bit too small compared to the other. Maybe the bottom of that eye should be extended downward a bit? Tashia - I like it overall. Perhaps make her skin and hair lighter? Her default colors in the game are white (silver-grey?) and yellow ... I'm not sure how much thought went into those choices. See attached screenshot. Amber - for my taste, her nose is too long and chin too sharp .. perhaps have her look at the camera? Nephele - I don't like this interpretation as much as the original (http://www.spellhold...les/nephele.jpg) .. if it's not out of character for her, I would prefer darker hair, lighter earrings, a wider mouth, rounder cheeks and inverted colors for her clothing (dark vest over colored blouse), and more of a yellow tone to her skin. Drizzt - perhaps add a bit more purple tone to his skin? He seems a bit grey. Gavin - I've attached one of his alternate portraits here. Seems to be a lot of brown with brown and lighter brown (yellow?) ... Like Kelsey, I think less angular jaw/chin. An earthy green color for his cloak might work? Or, maybe the orange color of the upper part of this Lathander symbol (http://www.nj-pbem.c...s/Lathander.htm) ? Finch - wider mouth, I think, with more of a smile, and bigger rounder spectacles (she has unique "glasses of identification"). She is a very energetic and cheerful personality. Colors .. for clothing, a splash of blue with some grey and brown? For hair -- in game, her hair is white(?) ... Perhaps make her hair short instead of hanging down? I think she needs a quill too. Perhaps tucked behind an ear? She has several dialogues where either she or some other NPC mentions that she is constantly scribbling notes with her quill. Oh, and not robes - Finch is a cleric and often a front line fighter! Edited by agb1, 29 January 2016 - 10:00 PM. 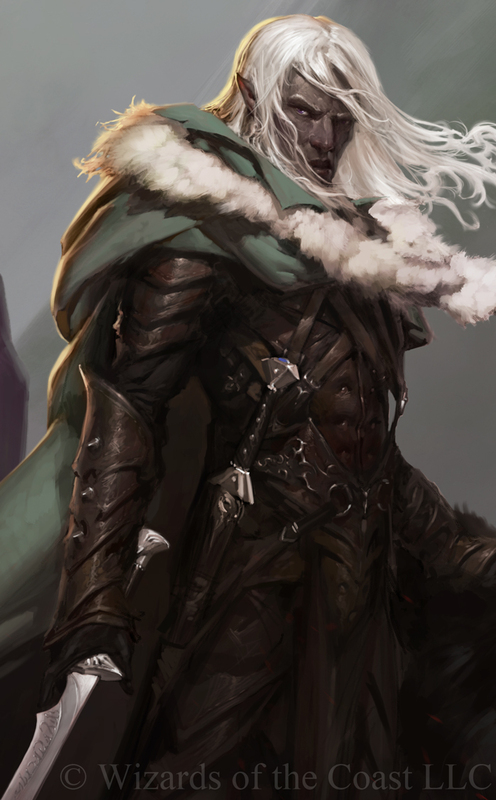 I think Drizzt looks pretty great as he is. Drizzt is usually pretty troubled, but he can be tender. He almost has a soft expression here. Maybe it could be hardened a little bit (slightly furrowed brows or narrowed eyes) to match his more usual demeanour. I don't think his skin needs any purple. If he looks washed out, I think that could be solved by reducing the brightness a teeny bit and adding more vibrant highlights. Here is a nice Drizzt portrait that avoids making his skin blue or purple. 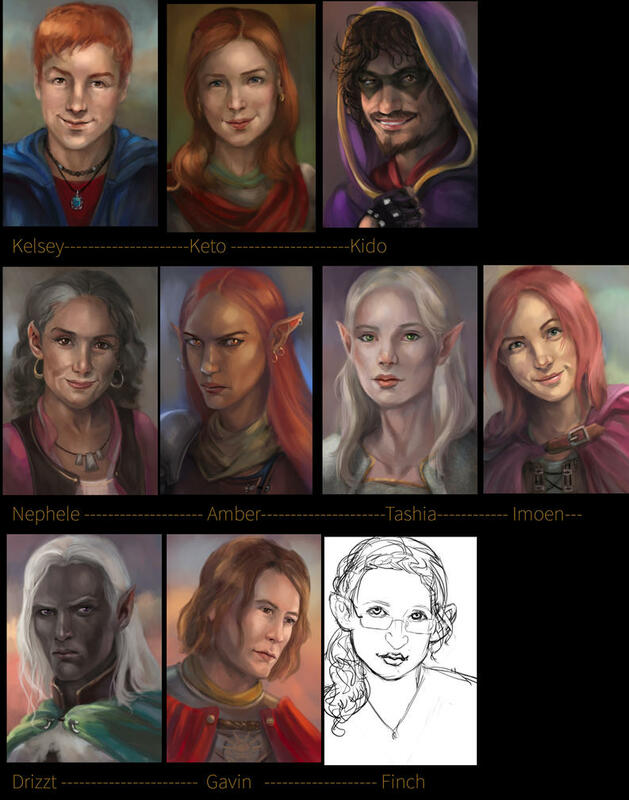 I agree with agb1 about most of the other portraits, though I think Keto looks fine, and I'm not very familiar with Kido/Tashia/Nephele. In-game, Finch starts wearing black and deep blue, and her hair is black, but it shows up kind of greyish. In the portrait, it appears dark brown. I'd be inclined to think that brown was correct, but I haven't played the mod recently to remember much about her except that she likes books. A lot. Edited by Mike1072, 30 January 2016 - 01:36 AM. More about Amber can be found here - I forgot that the mod includes a Bodhi abduction quest with a possibility of Amber becoming a vampire (for this scenario the mod has a vampire portrait too). I like Mike's suggestions above. Concerning Kelsey: I always thought he needs to look slightly mischievous. Maybe it is because of his voice; I am not sure. Generally, I agree with agb1. His face is a bit too square and the "regular" version is better. Tashia's facial expression in her original portrait is actually quite good in my opinion. Sometimes she is really pensive and troubled by the past. At other times she is pretty cheerful and cracking jokes. So, "dreamy scatterbrain" is not too far off, I guess. You could probably make her look softer and less strict. The colors are fine. At least her dialogue indicates that she has green eyes and fair hair. If you are still considering other NPC mods, I would like to suggest the Icewind Dale NPCs by Kulyok and Tyris Flare by Grim Squeaker. I think I have to join for a sec. Indeed, the skin tone could be darker, but the gray hair was intended and it's the author who insisted on it as well as on some wrinkles, I remember that as I am the one who also worked on the portrait. Keto also looks fine. Note that the portrait isn't to exactly show everything about the character. Because finding out that shy-looking person is shy is much less interesting than finding out that the smiled bard you meet in a tavern actually has some problems. There is a dialogue between the character and the portrait and by actually spending some time with the NPC you are to find who she really is. The original portrait does not offer the "unpreapered" look, too. Finch - the item may have an animation of the glasses of identification, but her original portrait suggest something quite normal. The item has that kind of icon because the game's resources are used and the game does not offer many icons for glasses. Thanks for the corrections, Lava. For Nephele, compared to Arta's design, I see that in the version you referenced she has a wider mouth and a longer, more oval face shape. I would prefer it if Arta's version were a bit more similar to that. For Keto, you convinced me. The design above is fine. For Finch, I agree her glasses do not need to look like the glasses of identification icon in the game. I suggested big round spectacles because I thought it would be a distinctive look, and I think of Finch as a distinctive-looking character. What do you think of having her hair stick out at odd angles and giving her a fey (feral?) appearance as suggested in the references I listed? I think the gnome info you posted is from 4th edition. It introduced The Feywild as an important plane and retconned elves and gnomes as originally being from there. In 3.5 and earlier editions, I don't think gnomes were related to fey creatures or elves. Rock gnomes average between 3 and 3 1/2 feet tall, and weigh between 40 and 45 pounds. Their skin comes in many different shades of brown, but is unaffected by exposure to the sun. The hair of young gnomes can vary greatly in color, but in adulthood they all tend toward gray or white. The males wear their beards neatly trimmed. Edited by Mike1072, 02 February 2016 - 10:31 PM. Thanks for all the feedback, everyone! I don't know that there's really any point to post in-progress stuff at this stage as it's still kinda messy hehe but I have been working at incorporating those changes.... I'll post an update when I've tackled all of them a bit more. I suppose I picture gnomes as the older versions with more roundness + big-noses, like matching with Jan's portrait... there really aren't too many good art examples of them, unfortunately! (That rock gnome just looks like... any regular person. With slightly taller ears?) xD And I picture halflings rounder, too, though I suppose that's like D&D 1.0 and now they're just mini-humans. I was trying to do everyone's ears a bit differently at least, so the halflings, elves, and gnomes (and tiefling) had different varieties of ears. Is Finch a rock gnome specifically? Would it make sense to give her white and/or short hair then? Because I imagine most people are more familiar with the portrait vs the paper doll when it comes to picturing her. And Jan definitely has the erratic hair thing going on, though it really fits his personality -- would messy hair fit Finch's personality, too? It's so hard when I don't know these characters very well, sigh. We can save the vampire Amber portrait for a future round... just a note for now. Still need to figure out Finch but here is a progress shot of the rest of them! Kelsey: I think the portrait looks great. Keto: Something I liked about the previous version has been lost. Trying to put my finger on it, I think it was the dimpled cheeks that gave her a nice distinctive appearance. Kido: To me, he looks too creepy now. I'm not sure how old he is -- this version looks much more mature than the previous one. Something in between perhaps? After looking at Kido's dialogue, I'd say this portrait is spot-on actually. I hadn't realized quite how insane he is. He is very, very insane. Nephele: I like this version, but perhaps have her looking a bit more upward (because she is a halfling...)? Amber: I think the portrait looks great. Tashia: I like this version overall, but prefer the shape of the mouth from the previous version (more pout or frown). Edit: also, can we bring back the braid? Imoen: I liked the slightly softer and flatter nose and the slightly wider cheeks and mouth of the previous version - more whimsical, less sharp somehow? Drizzt: As Mike put it, the previous version seemed to have a tender expression; I prefer that over the more angry look of the new version. Gavin: I like this version overall, but might rotate the image a bit to the left so his shoulders are more level (he can still be looking down) -- he seems a little off balance now. Edited by agb1, 04 February 2016 - 06:24 PM. ... so she has some gray in her hair. ... so she has glowing eyes? ... so she has some white in her hair too, maybe. ... so she has a bulbous nose and wiry hair. When asked about her past, FINCH BLOOMWHIFFLER is quick to enthuse about stories she has read, libraries she has visited and tomes that she has had the honor to copy. You sense that, for all her knowledge, Finch has never truly experienced a life of adventure outside the pages of a book until joining your travels. She wavers between trepidation and enthusiasm at each new turn, keeping her quill ever at the ready. ... so a quill would be an appropriate accessory. Edited by agb1, 04 February 2016 - 06:00 PM. I actually really love the intensity of Drizzt's expression. For Gavin, there's something about the size or positioning of his eyes that seems a little strange. Maybe it's just the angle of the head as agb1 says. For Finch, if you download the mod, there are a bunch of soundclips you can listen to to get an idea of her personality. She is quite peppy. About rock gnomes: that's what most gnomes are. 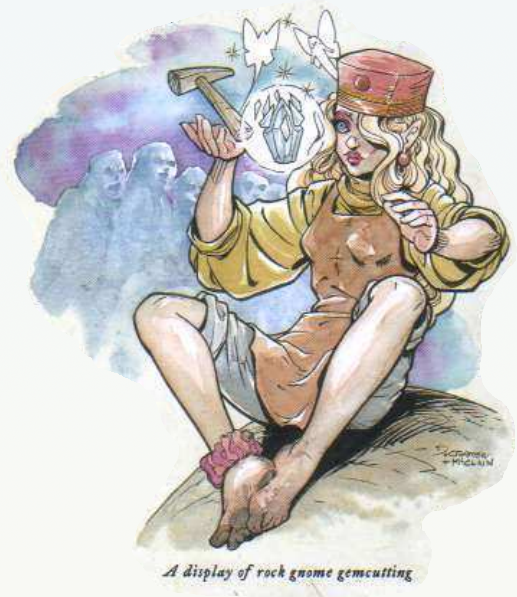 If it's not a deep gnome (svirfneblin) or a reclusive forest gnome, it's a rock gnome. I don't think she needs to have completely grey hair; the quote even mentioned that young gnomes have vastly varying hair colours. Short hair on the in-game avatar is inevitable, but I think the portrait should strive to be the definitive representation of the character, with the paperdoll and avatar serving as the closest approximation available in-game. That's probably referring to infravision. When switching to infravision to see in the dark, your eyes will glow, usually red. Drizzt's eyes are violet and when he uses infravision, they glow violet, because he is a special snowflake. Edited by Mike1072, 04 February 2016 - 06:22 PM.